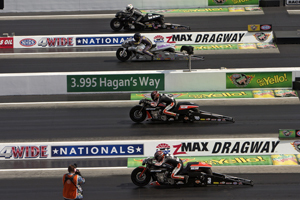 The Harley-Davidson® factory team struck back after early-round losses at the season opening event in Gainesville to take the title – and the points lead – in the Mello Yellow NHRA Pro Stock Motorcycle championship series at the 4-Wide Nationals at zMAX Dragway in Charlotte, NC. The event, taking place at Bruton Smith’s “Bellagio of drag strips” is unique on the NHRA tour. While a typical drag race has two racers facing off against each other, the 4-Wide has four riders lining up in a “quad” and competing at the same time. The first two riders crossing the finish line in each quad advance to the next round. Andrew Hines took the win in Charlotte as teammate Eddie Krawiec placed second in the final round quad. Matt Smith Racing teammates Scotty Pollacheck and John Hall, both riding S&S-powered Buells, placed third and fourth respectively. For the second race in a row qualifying was led by Michael Ray on the Star Racing Buell. Ray recoded a 6.816 elapsed time at 197 mph on Friday, which held up as the top spot throughout Saturday. “The way I look at it is if I am on my game, there is not a bike out there that is going to beat me," said Ray, who placed second in the points last season. Following Ray in qualifying was the Buell of Hector Arana Jr. at 6.825 seconds and Hines on his Harley at 6.842. In all, S&S-powered Buells accounted for six of the top eight qualifiers and 11 in the qualified field of 16. Reigning champ Matt Smith, who qualified sixth at 6.856 seconds on his Stockseth Racing Buell, set a new zMAX Dragway speed record for the class at 198.32 mph. While number one qualifier Ray was confident going into Sunday’s eliminations, his bike defied him as a shifting problem put him on the trailer in round one. The second round semifinals saw an all-Buell quad with Hall and Pollacheck advancing to the final over second year rider Chaz Kennedy and veteran Mike Berry. In the other semifinal the father and son duo of Hector Arana Jr. and Sr. lined up their Buells against the Harleys of Hines and Krawiec with both Harley riders advancing. The difficult thing about racing at zMAX is dealing with the disparity of the lanes, which is greater than it is at two-lane drag strips. This year, lanes 1 and 2 were the coveted lanes and the Harley-Davidson riders were able to secure them for the final. Hall and Pollacheck got the jump on the Harleys in the final but Hall had transmission problems and Pollacheck lost top end speed as the Harleys rode around them with Hines taking his 33rd career win, tying the late John Myers. None of those wins, however, has come at the 4-Wide event. In fact, despite winning the Charlotte race run in the conventional two-lane format last fall, Hines has never even won an elimination round at a 4-Wide. With the win, Hines holds an 11-point advantage over Pollacheck who had made both finals this year. Following them in the points is Hall Krawiec, Arana Jr. and Gainesville winner Steve Johnson, the top Suzuki in the points. The next event in the NHRA Pro Stock Motorcycle series is the NHRA Summit Southern Nationals at Atlanta Dragway in Commerce, GA, May 16-18.